Utagawa Kuniyoshi (1797-1861) The Battle of Kojima Jubei Castle, 1849 - 1850. Oban Triptych. This fabulous musha-e triptych by Kuniyoshi is almost a companion to Kagesue, Takatsuna and Shigetada Crossing the Uji River from the year before. 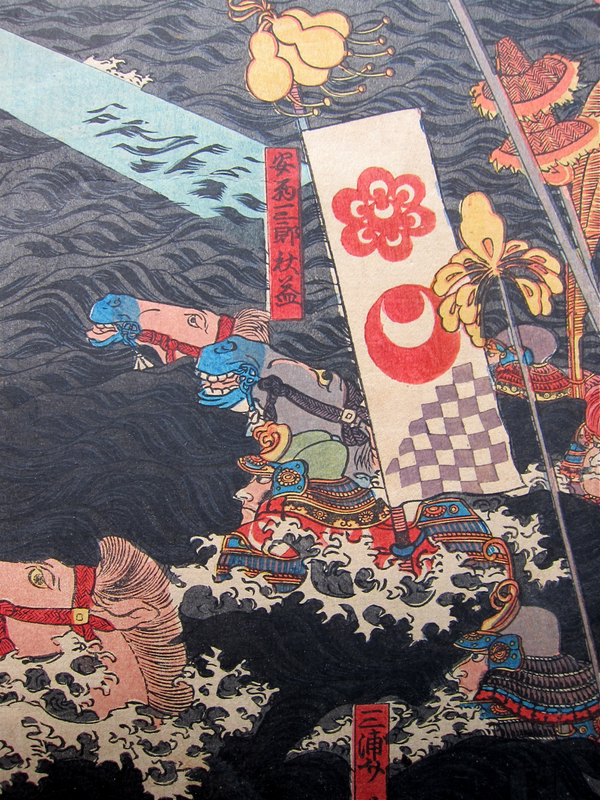 Kuniyoshi uses the same terrific shorthand to evoke the dark waves and choppy water. Once again, Kuniyoshi plays with the scale of the figures in relation to the landscape, evoking man’s smallness in comparison to nature and his place in the scale of the world - an old Buddhist precept. Compositionally direct, nevertheless sophisticated, Kuniyoshi places the army of Minamoto no Nriyori in the foreground, swamped by the vastness of the tide. The rising sun, the motif shortly to be adopted by the Japanese nation, is abstracted here, drawing the viewer into the enormity of the natural world. The conception of the print is bold and the execution superb. The Battle of Kojima took place during the Genpei War of the Heian period. In 1184, Minamoto no Nriyori pursued the fleeing Taira Clan from Ichi-no-Tani. They defeated the Taira at Kojima in an attack led by Sasaki Moritsuna, pictured here on the right, who swam his horse across the narrow straits of the inland sea between Kojima and Honshu. He led the attack on the Taira at Bizen Castle - pictured here in the upper left. Kuniyoshi owes a debt to Kunisada in this print. The entire of the background and especially the sunburst pattern in the sky and the sea is taken wholesale from Kunisada's rare landscape print, Dawn at Futamigaura of 1832. A very fine print by Kuniyoshi. Colour and impression are all fine, the condition is very good and the print is unbacked, some surface marks and two vertical folds. Extensive mica in the waves. A copy of this print is in the British Museum London.